Square Enix doesn't just make video games. It also makes toys. Cool toys. Like these. The company's Play Arts line is bringing Final Fantasy VII: Advent Children to life with Cloud Strife, Tifa Lockheart, Barret Wallace, and Red XIII. The Cloud figure is 12,960 yen (US$120), while the others are 10,584 yen ($98). Red XIII will be out in December in Japan, while Barret and Tifa will be out next January. 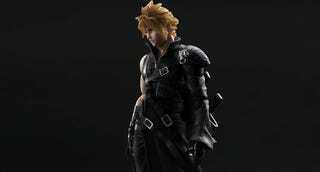 Cloud is slated for an April release.